HOME MADE - SURFING IN TASMANIA was first shown at Princes Wharf on Hobart's waterfront as part of the 2013 Mystate Australian Wooden Boat Festival. The exhibition generated considerable interest and, with the assistance of the Hobart City Council, the exhibition was transferred after the festival to the Carnegie Gallery, in the same building as the Maritime Museum. The exhibition is gradually moving around the State, travelling to St Helens, Burnie, Low Head Pilot Station, Swansea and Flinder's Island as well as a number of local LINC Tasmania branches. Using boards, clothing, contemporary accounts from newspapers and those who were there making it happen, as well as some awesome photographs, HOME MADE - Surfing in Tasmania seeks to understand Tasmania's contribution to surfing culture and also what makes surfing the islands unique and special. As well as showing off some beautiful surfboards! 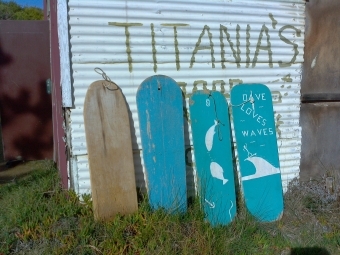 Boards displayed varied from a nine foot six inch long monster called 'The Gun', used by professional Tasmanian surfer Shaun Wallbank to surf Tasmania's biggest waves, to Margerie Thompson's board, made in 1925 from an old cedar table by E Harvie Thompson and used for bodyboarding at Clifton Beach for forty years until the 1960s. 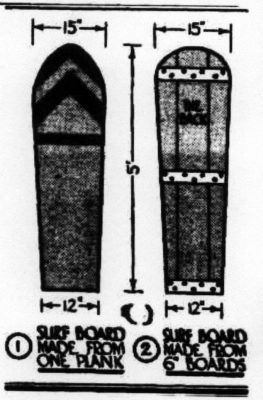 The collection of boards showed the evolution of surfing. 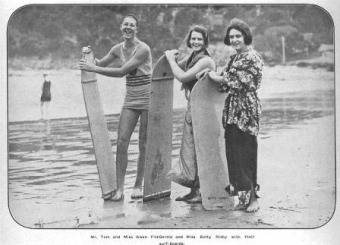 Small, home made boards from the 1920s were taken to beach parties and picnics and ridden prone, straight to shore. 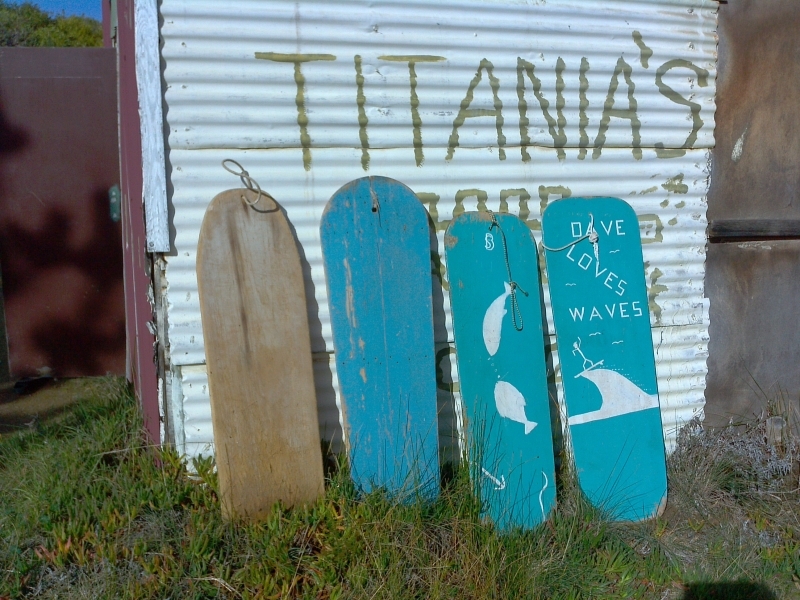 Tasmania's attraction for modern day surfers from around the world is shown through longboards used to surf some of the world's biggest waves. Many early boards were homemade, in backyards or even near the beach itself, but the exhibition shows how commercial interests were quick to catch on to Tasmanian's enthusiasm for surfing with timber companies in Hobart and Launceston producing boards from the 1920s onwards. Materials, too, have changed. the simple sheets of wood with, perhaps, a steamed nose and battens for stength of the early belly boards were replaced in the 1950s by the 'Okinui' style boards of shaped wood on which the surfer could stand, introducing the shapes and styles of boards and surfing we recognise today. In the sixties and seventies the mood was for modern, man-made materials and the exhibition includes boards made from polystyrene and fibreglass form Tasmanian firms such as Turn, Tern, Fresh Juice, Milch, Osprey and Stranger. A return to traditional materials is shown by examples of hollow-framed timber boards made in the last few years and including traditional Tasmanian boat building timbers, such has King Billy pine and Celery Top pine. As boards and the style of surfing changed, so did the culture around it. 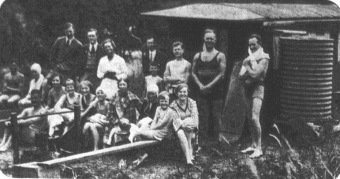 The beach shack culture of picnics and days on the beach for families and groups of friends of both sexes for the relatively well off of the 1920s developed after the war with the emergence of the competitative, disciplined, exclusively male Surf Lifesaving clubs. By the sixties, surfing was appealing to a younger generation rebelling against the discipline and conformity of the post war years and these young surfers sought out new beaches and breaks, often driving for hours or trekking through the bush for miles in search of breaks that would be nicknamed - Fluffies, Horries Flobnobs, Rubbish Dump - to preserve the secrecy of their location. The exhibition includes examples of early beachwear; woollen swimsuits, football shirts and board shorts. Early wetsuits were also exclusively male, with the girls having to make do with ill-fitting wetsuits unaccustomed to their shape. We don't have an early wetsuit in the exhibition. But we'd love one, so if there is an old, mouldy, snagged or even torn, wetsuit hanging around in the back of your garage or shack, please do let us know! 4 rindless bacon rashers. Chopped. 220g speck or similar. Chopped. Homemade puff pastry enough for your favourite pie dish. Or two sheets of thawed frozen pastry. 10 large eggs (plus an extra beaten egg for glaze). Grease your favourite pie dish and line it with pastry. Fry the bacon and speck in a dry frying pan over a medium heat, stirring, until lightly cooked. Drain on paper towel and allow to cool. Whisk six eggs with the milk, parsley, nutmeg or cayenne pepper, salt and pepper. Spread half the cooked bacon in the pie dish and poor in the egg mixture. Carefully crack the remaining 4 eggs into the mixture so they don’t break and scatter the remaining bacon over the top. Brush the rim of the pastry with beaten egg then top with pastry. Trim neatly. Brush the top of the pie with beaten egg then bake for 15 minutes. Reduce oven to 170°C and bake for 25 – 30 minutes or until the crust is golden brown. Remove pie from oven and allow it to cool in the dish before serving. Gently heat olive oil, add garlic and chilli and cook, stirring, over a medium heat for 1 – 2 minutes until fragrant and garlic has softened. Add remaining ingredients and simmer gently until reduced and thickened, probably about 5 minutes. Do you have your own favourite egg and bacon pie recipe? Or is there a particular something that was always in the pack-up that went with you to the beach? We'd like to hear from you.